SECTION 4. The term of office of the Senators shall be six years and shall commence, unless otherwise provided by law, at noon on the thirtieth day of June next following their election. No Senator shall serve for more than two consecutive terms. Voluntary renunciation of the office for any length of time shall not be considered as an interruption in the continuity of his service for the full term for which he was elected. (3) Each legislative district shall comprise, as far as practicable, contiguous, compact and adjacent territory. Each city with a population of at least two hundred fifty thousand, or each province, shall have at least one representative. SECTION 7. The Members of the House of Representatives shall be elected for a term of three years which shall begin, unless otherwise provided by law, at noon on the thirtieth day of June next following their election. (7) If by the end of any fiscal year, the Congress shall have failed to pass the general appropriations bill for the ensuing fiscal year, the general appropriations law for the preceding fiscal year shall be deemed reenacted and shall remain in force and effect until the general appropriations bill is passed by the Congress. SECTION 3. There shall be a Vice-President who shall have the same qualifications and term of office and be elected with and in the same manner as the President. He may be removed from office in the same manner as the President. SECTION 4. The President and the Vice-President shall be elected by direct vote of the people for a term of six years which shall begin at noon on the thirtieth day of June next following the day of the election and shall end at noon of the same date six years thereafter. The President shall not be eligible for any reelection. No person who has succeeded as President and has served as such for more than four years shall be qualified for election to the same office at any time. No Vice-President shall serve for more than two consecutive terms. Voluntary renunciation of the office for any length of time shall not be considered as an interruption in the continuity of the service for the full term for which he was elected. The returns of every election for President and Vice-President, duly certified by the board of canvassers of each province or city, shall be transmitted to the Congress, directed to the President of the Senate. Upon receipt of the certificates of canvass, the President of the Senate shall, not later than thirty days after the day of the election, open all certificates in the presence of the Senate and the House of Representatives in joint public session, and the Congress, upon determination of the authenticity and due execution thereof in the manner provided by law, canvass the votes. The Supreme Court, sitting en banc, shall be the sole judge of all contests relating to the election, returns, and qualifications of the President or Vice- President, and may promulgate its rules for the purpose. SECTION 7. The President-elect and the Vice-President-elect shall assume office at the beginning of their terms. If the President-elect fails to qualify, the Vice-President-elect shall act as President until the President-elect shall have qualified. If a President shall not have been chosen, the Vice-President-elect shall act as President until a President shall have been chosen and qualified. If at the beginning of the term of the President, the President-elect shall have died or shall have become permanently disabled, the Vice-President-elect shall become President. Where no President and Vice-President shall have been chosen or shall have qualified, or where both shall have died or become permanently disabled, the President of the Senate or, in case of his inability, the Speaker of the House of Representatives shall act as President until a President or a Vice-President shall have been chosen and qualified. SECTION 10. The Congress shall, at ten o’clock in the morning of the third day after the vacancy in the offices of the President and Vice-President occurs, convene in accordance with its rules without need of a call and within seven days enact a law calling for a special election to elect a President and a Vice-President to be held not earlier than forty-five days nor later than sixty days from the time of such call. The bill calling such special election shall be deemed certified under paragraph 2, Section 26, Article VI of this Constitution and shall become law upon its approval on third reading by the Congress. Appropriations for the special election shall be charged against any current appropriations and shall be exempt from the requirements of paragraph 4, Section 25, Article VI of this Constitution. The convening of the Congress cannot be suspended nor the special election postponed. No special election shall be called if the vacancy occurs within eighteen months before the date of the next presidential election. The President shall have the power to make appointments during the recess of the Congress, whether voluntary or compulsory, but such appointments shall be effective only until after disapproval by the Commission on Appointments or until the next adjournment of the Congress. The suspension of the privilege of the writ shall apply only to persons judicially charged for rebellion or offenses inherent in or directly connected with the invasion. SECTION 19. Except in cases of impeachment, or as otherwise provided in this Constitution, the President may grant reprieves, commutations and pardons, and remit fines and forfeitures, after conviction by final judgment. SECTION 2. The Congress shall have the power to define, prescribe, and apportion the jurisdiction of various courts but may not deprive the Supreme Court of its jurisdiction over cases enumerated in Section 5 hereof. SECTION 4. (1) The Supreme Court shall be composed of a Chief Justice and fourteen Associate Justices. It may sit en banc or in its discretion, in divisions of three, five, or seven Members. Any vacancy shall be filled within ninety days from the occurrence thereof. (3) Cases or matters heard by a division shall be decided or resolved with the concurrence of a majority of the Members who actually took part in the deliberations on the issues in the case and voted thereon, and in no case, without the concurrence of at least three of such Members. When the required number is not obtained, the case shall be decided en banc: Provided, that no doctrine or principle of law laid down by the court in a decision rendered en banc or in division may be modified or reversed except by the court sitting en banc. SECTION 7. (1) No person shall be appointed Member of the Supreme Court or any lower collegiate court unless he is a natural-born citizen of the Philippines. A Member of the Supreme Court must be at least forty years of age, and must have been for fifteen years or more a judge of a lower court or engaged in the practice of law in the Philippines. SECTION 9. The Members of the Supreme Court and judges of lower courts shall be appointed by the President from a list of at least three nominees prepared by the Judicial and Bar Council for every vacancy. Such appointments need no confirmation. (2) A case or matter shall be deemed submitted for decision or resolution upon the filing of the last pending, brief, or memorandum required by the Rules of Court or by the court itself. SECTION 2. No Member of a Constitutional Commission shall, during his tenure, hold any other office or employment. Neither shall he engage in the practice of any profession or in the active management or control of any business which in any way be affected by the functions of his office, nor shall he be financially interested, directly or indirectly, in any contract with, or in any franchise or privilege granted by the Government, any of its subdivisions, agencies, or instrumentalities, including government-owned or controlled corporations or their subsidiaries. SECTION 5. The Congress shall provide for the standardization of compensation of government officials and employees, including those in government-owned or controlled corporations with original charters, taking into account the nature of the responsibilities pertaining to, and the qualifications required for their positions. SECTION 1. (1) There shall be a Commission on Elections composed of a Chairman and six Commissioners who shall be natural-born citizens of the Philippines and, at the time of their appointment, at least thirty-five years of age, holders of a college degree, and must not have been candidates for any elective position in the immediately preceding elections. However, a majority thereof, including the Chairman, shall be Members of the Philippine Bar who have been engaged in the practice of law for at least ten years. (8) Recommend to the President the removal of any officer or employee it has deputized, or the imposition of any other disciplinary action, for violation or disregard of, or disobedience to its directive, order, or decision. (9) Submit to the President and the Congress a comprehensive report on the conduct of each election, plebiscite, initiative, referendum, or recall. SECTION 4. The Commission may, during the election period, supervise or regulate the enjoyment or utilization of all franchises or permits for the operation of transportation and other public utilities, media of communication or information, all grants, special privileges, or concessions granted by the Government or any subdivision, agency, or instrumentality thereof, including any government-owned or controlled corporation or its subsidiary. Such supervision or regulation shall aim to ensure equal opportunity, time, and space, and the right to reply, including reasonable, equal rates therefor, for public information campaigns and forums among candidates in connection with the objective of holding free, orderly, honest, peaceful, and credible elections. SECTION 2. (1) The Commission on Audit shall have the power, authority, and duty to examine, audit, and settle all accounts pertaining to the revenue and receipts of, and expenditures or uses of funds and property, owned or held in trust by, or pertaining to, the Government, or any of its subdivisions, agencies, or instrumentalities, including government-owned or controlled corporations with original charters, and on a post-audit basis: (a) constitutional bodies, commissions and offices that have been granted fiscal autonomy under this Constitution; (b) autonomous state colleges and universities; (c) other government-owned or controlled corporations and their subsidiaries; and (d) such non-governmental entities receiving subsidy or equity, directly or indirectly, from or through the Government, which are required by law or the granting institution to submit to such audit as a condition of subsidy or equity. However, where the internal control system of the audited agencies is inadequate, the Commission may adopt such measures, including temporary or special pre-audit, as are necessary and appropriate to correct the deficiencies. It shall keep the general accounts of the Government and, for such period as may be provided by law, preserve the vouchers and other supporting papers pertaining thereto. SECTION 18. The Congress shall enact an organic act for each autonomous region with the assistance and participation of the regional consultative commission composed of representatives appointed by the President from a list of nominees from multisectoral bodies. The organic act shall define the basic structure of government for the region consisting of the executive department and legislative assembly, both of which shall be elective and representative of the constituent political units. The organic acts shall likewise provide for special courts with personal, family, and property law jurisdiction consistent with the provisions of this Constitution and national laws. SECTION 8. The Ombudsman and his Deputies shall be natural-born citizens of the Philippines, and at the time of their appointment, at least forty years old, of recognized probity and independence, and members of the Philippine Bar, and must not have been candidates for any elective office in the immediately preceding election. The Ombudsman must have for ten years or more been a judge or engaged in the practice of law in the Philippines. SECTION 2. All lands of the public domain, waters, minerals, coal, petroleum, and other mineral oils, all forces of potential energy, fisheries, forests or timber, wildlife, flora and fauna, and other natural resources are owned by the State. With the exception of agricultural lands, all other natural resources shall not be alienated. The exploration, development, and utilization of natural resources shall be under the full control and supervision of the State. The State may directly undertake such activities, or it may enter into co-production, joint venture, or production-sharing agreements with Filipino citizens, or corporations or associations at least sixty per centum of whose capital is owned by such citizens. Such agreements may be for a period not exceeding twenty-five years, renewable for not more than twenty-five years, and under such terms and conditions as may be provided by law. In cases of water rights for irrigation, water supply, fisheries, or industrial uses other than the development of water power, beneficial use may be the measure and limit of the grant. The Congress may, by law, allow small-scale utilization of natural resources by Filipino citizens, as well as cooperative fish farming, with priority to subsistence fishermen and fishworkers in rivers, lakes, bays, and lagoons. SECTION 4. The State shall, by law, undertake an agrarian reform program founded on the right of farmers and regular farmworkers, who are landless, to own directly or collectively the lands they till or, in the case of other farmworkers, to receive a just share of the fruits thereof. To this end, the State shall encourage and undertake the just distribution of all agricultural lands, subject to such priorities and reasonable retention limits as the Congress may prescribe, taking into account ecological, developmental, or equity considerations, and subject to the payment of just compensation. In determining retention limits, the State shall respect the right of small landowners. The State shall further provide incentives for voluntary land-sharing. SECTION 9. The State shall, by law, and for the common good, undertake, in cooperation with the public sector, a continuing program of urban land reform and housing which will make available at affordable cost decent housing and basic services to underprivileged and homeless citizens in urban centers and resettlements areas. It shall also promote adequate employment opportunities to such citizens. In the implementation of such program the State shall respect the rights of small property owners. SECTION 10. Urban or rural poor dwellers shall not be evicted nor their dwellings demolished, except in accordance with law and in a just and humane manner. SECTION 11. The State shall adopt an integrated and comprehensive approach to health development which shall endeavor to make essential goods, health and other social services available to all the people at affordable cost. There shall be priority for the needs of the underprivileged sick, elderly, disabled, women, and children. The State shall endeavor to provide free medical care to paupers. SECTION 12. The State shall establish and maintain an effective food and drug regulatory system and undertake appropriate health manpower development and research, responsive to the country’s health needs and problems. SECTION 13. The State shall establish a special agency for disabled persons for rehabilitation, self-development and self-reliance, and their integration into the mainstream of society. SECTION 4. (1) The State recognizes the complementary roles of public and private institutions in the educational system and shall exercise reasonable supervision and regulation of all educational institutions. Proprietary educational institutions, including those cooperatively owned, may likewise be entitled to such exemptions subject to the limitations provided by law including restrictions on dividends and provisions for reinvestment. No member of the military shall engage directly or indirectly in any partisan political activity, except to vote. (4) No member of the armed forces in the active service shall, at any time, be appointed or designated in any capacity to a civilian position in the Government including government-owned or controlled corporations or any of their subsidiaries. SECTION 8. The State shall, from time to time, review to upgrade the pensions and other benefits due to retirees of both the government and the private sectors. Of the Senators elected in the election of 1992, the first twelve obtaining the highest number of votes shall serve for six years and the remaining twelve for three years. SECTION 26. The authority to issue sequestration or freeze orders under Proclamation No. 3 dated March 25, 1986 in relation to the recovery of ill-gotten wealth shall remain operative for not more than eighteen months after the ratification of this Constitution. However, in the national interest, as certified by the President, the Congress may extend said period. 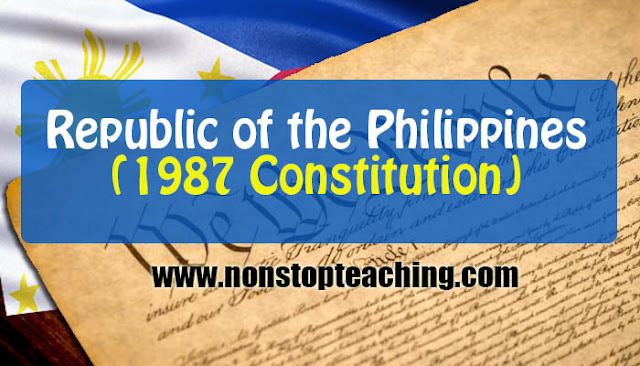 Read the 1987 Contitution of the Republic of the Philippines.